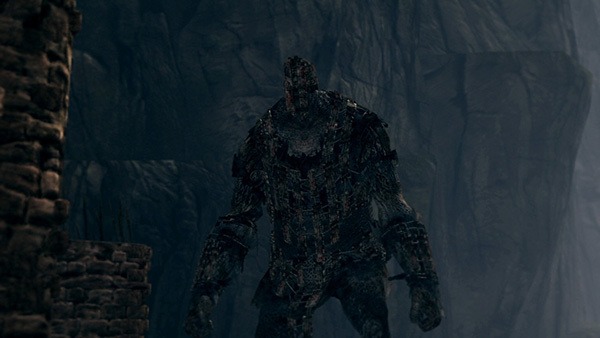 Huge colossi that tower over the player, acting as minibosses throughout Sen's Fortress. They pack a real punch but get exhausted after their frenzy attack, leaving themselves vulnerable to the player during that time. Only the Boulder Giant will respawn if killed. 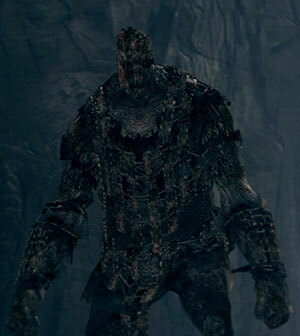 A Gatekeeper Giant opens the portcullis after ringing both Bells of Awakening, and can be found by hitting an illusory wall by the top of the ladder that exits the tar-pit area. A second giant drops boulders that act as an obstacle and trap in the interior of Sen's Fortress. The Boulder Giant can be accessed by making a running jump onto the rooftop, near the entrance to the Crestfallen Merchant's tower. The third giant throws large firebombs at the player in the final area of Sen's Fortress. The Firebomb Giant is found on the highest rooftop and will make the boss fight more difficult if not killed first. All can be easily killed off with melee (you can reach the stone feeding Giant by jumping from the bridge), with the firebomb one being a requirement or your boss fight in Sen's Fortress will become extremely hard (he bombs that area as long as he is alive). Just approach them and wait till they start their gound-pounding frenzy and move away. Once it's over they're totally exhausted and will get down to their knees for roughly 5~10 seconds, leaving them open for your attacks with no way of defense. Rinse and repeat until they're dead. Bring some Poison Arrows and let them do their job. Pretty easy, but note that especially on a New Game Plus they have lots of health and high resistance, so it may take a long time for them to get killed by the poison effect. Giants can be distracted with Aural Decoy, though this only works during melee combat. Aural Decoy will not have effect on the tracking of thrown firebombs or the boulder pathing. Entering the fortress from either the Undead Parish or Anor Londo will sometimes cause the Boulder Giant to disappear. Resting at the bonfire seems to fix this (but does not prevent it from re-occurring).